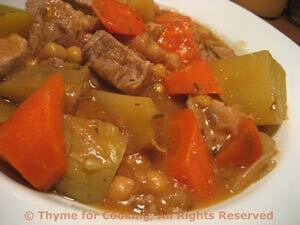 Pork and Chickpea Stew, hearty one dish dinner, Thyme for Cooking. Put everything in the pot and let it cook - stews are easy. This has just a hint of North African flavors (despite the pork). Cut pork into 1 1/2" (4cm) pieces. Quarter the potatoes the long way then cut in half or thirds depending on size. Put in a bowl of water to avoid discoloring. Add cumin, paprika, onion, pork and brown quickly. Add garlic, ginger and sauté 1 minute. Add carrots, rosemary, fennel seeds, wine, stock, tomato paste and bring to a boil. Cover, reduce heat and simmer 5 minutes. Add potatoes, chickpeas and simmer 30 minutes longer, just until vegetables are tender. Pierce vegetables with a fork or sharp knife to see if they are done; if not simmer another 5 - 10 minutes. Uncover, increase heat and add cornstarch, stirring until sauce is thickened. Serve directly from pot or ladle into serving bowl.